MMA • Sandy fighter Sean O'Connell has a cult following for his weigh-in wit, but he's serious about the value of persistence. Trent Nelson | The Salt Lake Tribune Sean O'Connell works out at Jeremy Horn's Elite Performance MMA in Sandy, Wednesday June 8, 2016. O'Connell was a walk-on linebacker at the University of Utah, too slow and undersized, who continued to pursue his dream of being a professional athlete through mixed martial arts. He likewise became a sports radio personality, working on a show in the Bay Area on which UFC President Dana White. O'Connell asked White, on air, if he could have a contract. White didn't give him one. So O'Connell worked his way into a UFC contract the hard way, plowing ahead with a tough chin and hard strikes, while gaining a cult following on the Internet for his colorful weigh-in antics. Next week, in Ottawa, is a must-win fight for O'Connell as he vies to stay alive in the UFC. Trent Nelson | The Salt Lake Tribune Sean O'Connell works out at Jeremy Horn's Elite Performance MMA in Sandy, Wednesday June 8, 2016. O'Connell was a walk-on linebacker at the University of Utah, too slow and undersized, who continued to pursue his dream of being a professional athlete through mixed martial arts. He likewise became a sports radio personality, working on a show in the Bay Area on which UFC President Dana White. O'Connell asked White, on air, if he could have a contract. White didn't give him one. So O'Connell worked his way into a UFC contract the hard way, plowing ahead with a tough chin and hard strikes, while gaining a cult following on the Internet for his colorful weigh-in antics. Next week, in Ottawa, is a must-win fight for O'Connell as he vies to stay alive in the UFC. Trent Nelson | The Salt Lake Tribune Sean O'Connell works out at Jeremy Horn's Elite Performance MMA in Sandy, Wednesday June 8, 2016. O'Connell was a walk-on linebacker at the University of Utah, too slow and undersized, who continued to pursue his dream of being a professional athlete through mixed martial arts. He likewise became a sports radio personality, working on a show in the Bay Area on which UFC President Dana White. O'Connell asked White, on air, if he could have a contract. White didn't give him one. So O'Connell worked his way into a UFC contract the hard way, plowing ahead with a tough chin and hard strikes, while gaining a cult following on the Internet for his colorful weigh-in antics. Next week, in Ottawa, is a must-win fight for O'Connell as he vies to stay alive in the UFC. Trent Nelson | The Salt Lake Tribune Sean O'Connell works out at Jeremy Horn's Elite Performance MMA in Sandy, Wednesday June 8, 2016. O'Connell was a walk-on linebacker at the University of Utah, too slow and undersized, who continued to pursue his dream of being a professional athlete through mixed martial arts. He likewise became a sports radio personality, working on a show in the Bay Area on which UFC President Dana White. O'Connell asked White, on air, if he could have a contract. White didn't give him one. So O'Connell worked his way into a UFC contract the hard way, plowing ahead with a tough chin and hard strikes, while gaining a cult following on the Internet for his colorful weigh-in antics. Next week, in Ottawa, is a must-win fight for O'Connell as he vies to stay alive in the UFC. Trent Nelson | The Salt Lake Tribune Sean O'Connell works out at Jeremy Horn's Elite Performance MMA in Sandy, Wednesday June 8, 2016. O'Connell was a walk-on linebacker at the University of Utah, too slow and undersized, who continued to pursue his dream of being a professional athlete through mixed martial arts. He likewise became a sports radio personality, working on a show in the Bay Area on which UFC President Dana White. O'Connell asked White, on air, if he could have a contract. White didn't give him one. So O'Connell worked his way into a UFC contract the hard way, plowing ahead with a tough chin and hard strikes, while gaining a cult following on the Internet for his colorful weigh-in antics. Next week, in Ottawa, is a must-win fight for O'Connell as he vies to stay alive in the UFC. Trent Nelson | The Salt Lake Tribune Sean O'Connell works out at Jeremy Horn's Elite Performance MMA in Sandy, Wednesday June 8, 2016. O'Connell was a walk-on linebacker at the University of Utah, too slow and undersized, who continued to pursue his dream of being a professional athlete through mixed martial arts. He likewise became a sports radio personality, working on a show in the Bay Area on which UFC President Dana White. O'Connell asked White, on air, if he could have a contract. White didn't give him one. So O'Connell worked his way into a UFC contract the hard way, plowing ahead with a tough chin and hard strikes, while gaining a cult following on the Internet for his colorful weigh-in antics. Next week, in Ottawa, is a must-win fight for O'Connell as he vies to stay alive in the UFC. 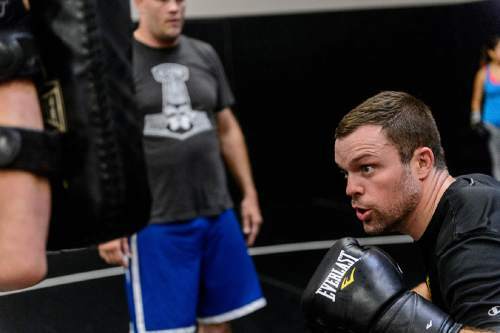 Trent Nelson | The Salt Lake Tribune Sean O'Connell works out with Jeremy Horn at Jeremy Horn's Elite Performance MMA in Sandy, Wednesday June 8, 2016. O'Connell was a walk-on linebacker at the University of Utah, too slow and undersized, who continued to pursue his dream of being a professional athlete through mixed martial arts. He likewise became a sports radio personality, working on a show in the Bay Area on which UFC President Dana White. O'Connell asked White, on air, if he could have a contract. White didn't give him one. So O'Connell worked his way into a UFC contract the hard way, plowing ahead with a tough chin and hard strikes, while gaining a cult following on the Internet for his colorful weigh-in antics. Next week, in Ottawa, is a must-win fight for O'Connell as he vies to stay alive in the UFC. On Utah&apos;s second day of practice in 2004, the year it would "bust" the BCS and win the Fiesta Bowl, a graduate assistant shouted to the sideline for another linebacker. New walk-on Sean O&apos;Connell looked to his left and saw two Polynesian players. They weren&apos;t Murphy. To his right, defensive backs. They weren&apos;t Murphy. "Who are you talking to, coach?" And so, with Urban Meyer wondering who dared to hold up his practice, O&apos;Connell was introduced to life as a mere body, the type of luckless no-name he now tries to resist lampooning as a sports radio personality for ESPN 700. The name stuck. To Utah football players and coaches from the era, O&apos;Connell is still Murph. Retelling that story would later help him land his first full-time job in radio, which led to another gig in which he begged UFC President Dana White, on-air, for a contract. White instead gave him the phone number of his matchmaker, and within a year, O&apos;Connell had a toehold in the world&apos;s premier mixed martial arts promotion  one he has yet to relinquish. So, it&apos;s a funny story. But for all the inauspiciousness of his many beginnings, O&apos;Connell has fought the perception that guys like him are a joke. Reality check • O&apos;Connell said sports were a reward for good grades in his household  "My parents were borderline anti-sports"  and he and his siblings had to work to pay for gear, clothes or toys. Only books came free. They were never denied a book. Childhood best friend Trevor Moss said O&apos;Connell was whip-smart, a charismatic kid who moved to Sandy from Minnesota in the third grade with a unique sense of style and humor. Moss, who later won a state championship and junior college All-American honors as a wrestler, figured O&apos;Connell would become an actor. Instead he grew into a powerful, square-jawed all-region linebacker at Jordan High and received a scholarship to Southern Utah, where, in his freshman year in 2002, the Thunderbirds went 1-10. SUU fired its coach, and at the urging of some friends, O&apos;Connell decided to walk on at the U. It was not what he thought it would be. Current U. head coach Kyle Whittingham oversaw the walk-on program then, and O&apos;Connell said Whittingham twice rejected him after slow times in the 40-yard dash. "I&apos;m sure they have a lot of guys who think they&apos;re awesome and they&apos;re not, which is what I was," he said. "Finally, he was like, &apos;Alright, good job.&apos; I guess I was just persistent enough. He let me on the team and they all promptly forgot about me, which is how you should treat a brand-new walk-on." O&apos;Connell woke at 5 a.m. for workouts. He endured being picked up by his throat and thrown to the ground by eventual NFL guard Chris Kemoeatu  "If you pissed him off, that&apos;s what he would do," he laughed. But even after what he considers the best practice of his life, he didn&apos;t crack the depth chart. He cried about it. He moved on. "The challenge was taking accountability for it and being realistic about who you are as a player without just despairing," he said. "... Everyone laughs at the dude who&apos;s out there just trying and not really succeeding, because nobody really knows what that&apos;s like." Reality check, Part II • After transferring to FCS Weber State for his senior season, O&apos;Connell began to contemplate becoming a professional fighter. "I always thought I was tough," he said. "If I ever got in any trouble as a kid, it was for fighting." He had trained during the offseason at a cardio kickboxing class taught in Sandy by the mother of his then-wife. 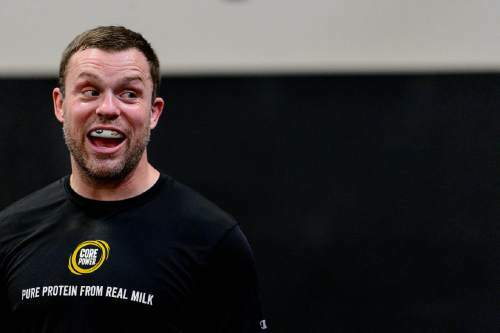 After his football career ended  he totaled seven tackles in seven games  he signed up for a local promotion known as the Ultimate Combat Experience, where a who&apos;s who of contemporary Utah mixed martial artists made their bones, or broke them. O&apos;Connell fought seven times between April and December in 2007, going 6-1 by relentlessly driving forward and overpowering his opponents. 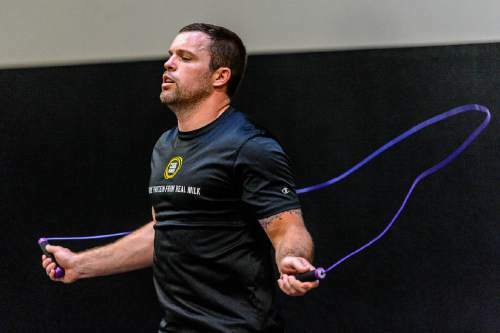 O&apos;Connell began to hear two things: 1) He could fight in the UFC, and 2) He needed to train with Sandy trainer Jeremy Horn at Elite Performance. Horn is among the most accomplished fighters not only in Utah, but the world. In 1999, he choked unconscious future UFC Hall of Famer Chuck Liddell, and other opponents in his 119-bout career include Hall of Famers Randy Couture and Forrest Griffin. He&apos;d been impressed by O&apos;Connell&apos;s performance in UCE. O&apos;Connell wasn&apos;t afraid to be hit, which counterintuitively protects a fighter because, Horn said, punches tend to have less impact when a fighter sees them coming. And O&apos;Connell didn&apos;t shy away from the moment. His performance in fights was the sum of his abilities, less nothing. That&apos;s rare, Horn said. O&apos;Connell had trained by running hills in Sugar House park and wrestling in the grass with friends and coworkers from his job slinging bags at the airport. When Horn met O&apos;Connell, he was blunt. "This is not what you think it is," he said. "You need to come train with real people." It was the step up to college football all over again. O&apos;Connell sparred with fighters in Horn&apos;s gym who were far more accomplished than the grunts he&apos;d felled, and Horn found that the fearlessness that had served O&apos;Connell so well was verging on recklessness against higher-caliber light heavyweights. He needed just a dash of fear. "He doesn&apos;t care if somebody hits him," Horn said. "... As long as he gets to land two or three back, he&apos;s happy. Guys at that level and guys at that size, you can&apos;t afford that. Anybody can put you to sleep with one punch." O&apos;Connell learned more about what he didn&apos;t know when he tried out for Spike TV&apos;s UFC-sponsored "Ultimate Fighter," a reality show in which fighters share a house while they vie for a UFC contract. O&apos;Connell had to fight Shane Primm, a 6-foot-3 Muay Thai fighter, to gain entry to the house, and figuring that Primm was purely a striker, the 6-1 O&apos;Connell resolved to take him to the ground and negate his reach advantage. He figured wrong. Primm countered O&apos;Connell&apos;s takedown with a submission attempt and stayed two steps ahead until he was on O&apos;Connell&apos;s back, informing him via chokehold that he didn&apos;t know so much about jiu-jitsu, himself, and that he wouldn&apos;t be fighting in the UFC anytime soon. Opportunities knock • Between a divorce and yet another knock to his athletic aspirations, O&apos;Connell was "in a bad spot," Moss said. When he told family he planned to enlist in the military, his older brother persuaded him to think it over while first serving a six-month humanitarian mission to a sugar-farming town in Zambia. There, O&apos;Connell helped build a boarding school for girls who were victims of physical and sexual abuse. The simplicity revived him. "It reminds you of how Snapchat doesn&apos;t matter and Instagram followers are stupid and there are people in this world who have absolutely nothing that are happier and more grateful than any of us are," he said. Shortly after he returned to Utah, while he was working an office job, O&apos;Connell heard 1280 The Zone&apos;s John Lund announce that he was leaving the morning show he shared with Hans Olsen. Olsen  whom O&apos;Connell had once replaced as host of a little-heard, twice-weekly MMA show  would need a new co-host, and O&apos;Connell began calling The Zone&apos;s program director "incessantly," he said. Olsen had reservations. "In my mind, I&apos;m thinking, &apos;This guy&apos;s a fighter. He&apos;s got very limited on-air experience.&apos;" Like Olsen, O&apos;Connell fits the bill of a "two chair"  or talk radio&apos;s equivalent to a color commentator. It wasn&apos;t until a handful of prospects bombed that Olsen gave O&apos;Connell a shot as a "one chair," doing intros, outros and much of the heavy lifting in interviews. After about 20 minutes, Olsen said, he knew he had a partner. When Olsen heard the "Murphy" story, "My stomach hurt from laughing." O&apos;Connell continued to fight in the minor leagues of MMA. In 2010, he embarked on a stretch in which he won eight of nine, and five straight. Meanwhile, he got a taste of the UFC as a regular in the corner of fellow Elite Performance fighter DaMarcus Johnson, accompanying him to Abu Dhabi, United Arab Emirates, where they pranked other fighters by charging pricey meals to their rooms. O&apos;Connell and Olsen were split in 2012 after Larry H. Miller Group bought out 1280 The Zone and merged it with 1320 KFAN. He soon accepted a job as a host for the Bay Area&apos;s 95.7 The Game, which he&apos;d only have for a year. But it was at The Game that he was able to corner White. "I was just like, &apos;Dana, this has probably never happened before ... I&apos;m a radio guy, but I&apos;m also a very serious fighter ..."
White "kind of chuckled," O&apos;Connell said. He gave him a phone number, at least, and the voice on the other end told him he needed to beat a more proven fighter. He complied, prevailing by decision over former UFC vet Marvin Eastman in September 2013 to move to 14-4. 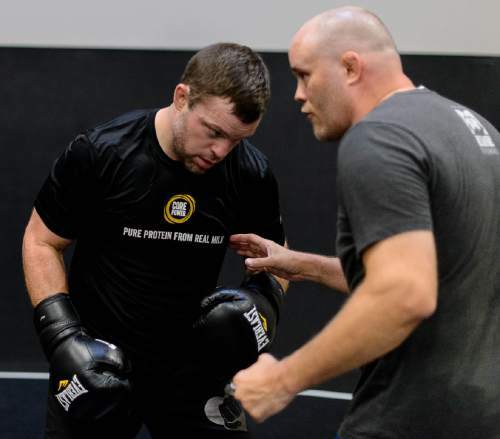 In spring 2014, after O&apos;Connell had moved back to Utah and was negotiating a contract with ESPN 700, he got a call asking if he&apos;d be willing to fight as a late replacement against Ryan Jimmo in Quebec City. Getting comfortable • He felt good, walking out to the cage. He was relaxed. The fight was even in the early-going. And then, late in the first of three five-minute rounds, Jimmo planted his right hand deep into the side of O&apos;Connell&apos;s face. O&apos;Connell had fought in the UFC, but he was 0-1. In O&apos;Connell&apos;s second fight, in Auckland, New Zealand, O&apos;Connell dropped Gian Villante with a left in the second round and traded frenzied blows for 15 minutes before the final bell. "I won that fight, right?" he could be heard asking Horn on the broadcast. "I think so," Horn told him. "Not a landslide." The ring announcer said the first judge had favored Villante. The second, O&apos;Connell. The third and decisive card gave the edge to "Giiiiian," and O&apos;Connell raised his arms, thinking he&apos;d heard "Seeeeean." Nope. "Villante!" 0-2. But the punch-packed fight earned O&apos;Connell a $50,000 Fight of the Night bonus and another shot, this time against 6-5 Matt Van Buren in Boston. Van Buren peppered him with hard blows throughout, but O&apos;Connell kept plodding forward until he drilled Van Buren with an overhand right, followed by a left to the chin that caused Van Buren to wobble and the ref to stop the fight. He&apos;d won. "It felt awesome," he said. "And that lasts for about two weeks and then you get back to work." O&apos;Connell reached .500 with a first-minute knockout of veteran Anthony Perosh in Adelaide, Australia, only to lose again in Boston this past January when he was on the receiving end of a dreaded overhand right from Ilir "The Sledgehammer" Latifi. That&apos;s partly what makes MMA so interesting, O&apos;Connell said, wearing his analyst cap: "Even a brief lapse of technique or focus, or getting beat in one particular movement, can mean the end of a fight or the end of a career or the end of a lifestyle." Horn said it weighs in O&apos;Connell&apos;s favor that he&apos;s regarded as a bankable act, and that the light heavyweight division is "a little slim." 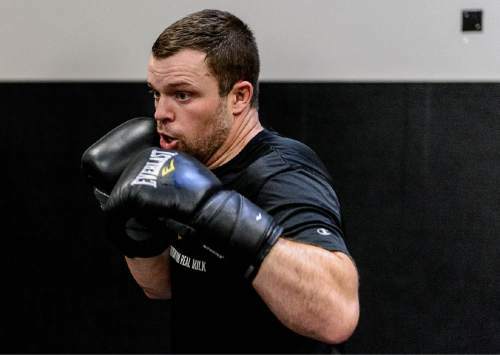 Should O&apos;Connell lose Saturday in Ottawa to former professional hockey player and fellow brawler Steve Bosse  the man he replaced in his first fight  it&apos;s probably not over for him. O&apos;Connell sees it like this: "I would imagine the UFC has categories that they put guys in: &apos;Let&apos;s build this guy up as an actual contender because we think he&apos;s got the skills to maybe be a champion someday.&apos; &apos;This guy is entertaining to watch.&apos; &apos;These are the bodies we feed to everybody else.&apos; I think I&apos;m at least in the &apos;This guy&apos;s entertaining to watch&apos; pile." Internet folk agree with that. O&apos;Connell has won an outsize share of nontraditional fans through his quirky weigh-in stunts, which began in his UCE days, when "I would just kind of ignore my opponent and flirt with the ring girls." "A lot of guys mean-mug each other," he said. "Why? You&apos;re not going to scare somebody. We&apos;re professional fighters. There&apos;s going to be a fight." At Horn&apos;s suggestion, O&apos;Connell compelled Jimmo to lock arms for a newlywed-style toast with their water bottles. He followed that by posing for a selfie with Villante, and he used his left index finger to softly bop the nose of a stone-faced Van Buren. A perplexed Perosh stood rigidly with raised fists clenched as O&apos;Connell played rock-paper-scissors, covering Perosh&apos;s unwitting rock with his paper and raising his arms in celebration. Most recently, O&apos;Connell presented Latifi with a bouquet of flowers. Latifi gave him a bag of Swedish candy in return. Even if he&apos;s probably most famous for a nose-bop, O&apos;Connell said he&apos;s "90 percent" sure he&apos;d be comfortable retiring if he were cut by the UFC. When he does retire, he said, his energy will be funneled toward writing. He already has published one novel, "Hellbound/Heavensent," about an apocalyptic battle between good and evil. In the works are the sequel, as well as a coffee-table book about women, a semi-satirical love story and a screenplay. "He is the most unique person I think I&apos;ve ever come across," Olsen said. "... When you first meet him, you realize real quick that anything he sets out to do, he&apos;s probably going to end up doing it." That, O&apos;Connell said, is his hallmark. He doesn&apos;t quit. He&apos;s sometimes asked which current football players would make the best UFC fighters, and given a list of standouts in the NFL and college. Give me their backups, he tells them  the guys who keep coming back for more punishment without any sure promise of reward. He&apos;s brought current and former standout players to Horn&apos;s gym and they can&apos;t endure the pain and embarrassment of starting at the bottom of the list and working their way toward the middle. "Thankfully, I don&apos;t have that trait where I&apos;m going to, for lack of a better term, punk out."